Am Donnerstag den 12. September 2013 versammelten sich zehn (!) Freunde Freier Software im altehrwürdigen Treppchen in Bonn, um über die zukünftige Gestaltung und Inhalte der Treffen zu diskutieren. Es wurde beschlossen, bei zukünftigen Treffen stets einen Vortrag einzuplanen. Dazu wird ein geeigneter Treffpunkt benötigt. Nach Diskussion über Kölner Veranstaltungsorte und Beratschlagung über mögliche Bonner Orte hat Guido sich bereit erklärt, den Netzladen anzusprechen. 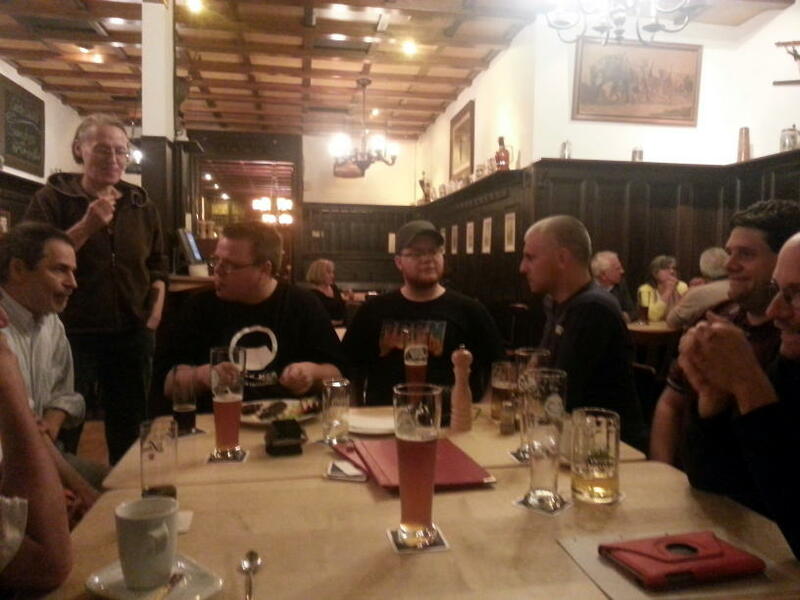 Für das nächste Treffen will Klaus friendica als Thema vorbereiten. Die derzeitige Organisatorin der Bonner Gruppe, Gabriele, trat aus persönlichen Gründen zurück. Gabriele hatte vorübergehend die Federführung für mich übernommen. Vielen Dank für deine beharrliche Arbeit Gabriele, die große Zahl der Interessierten an diesem Termin geht auch auf dein Konto! Es wurde mangelnde Transparenz der FSFE beklagt. Eines der nächsten Treffen sollte sich damit beschäftigen, wie die FSFE/Fellowship funktioniert und wie man sich daran beteiligen kann. EDIT: Es gibt noch niemanden, der Treffen in Köln organisiert. Fehlinfo entfernt. Imagine stepping out of a metro as a stranger in a hectic, crowded station. 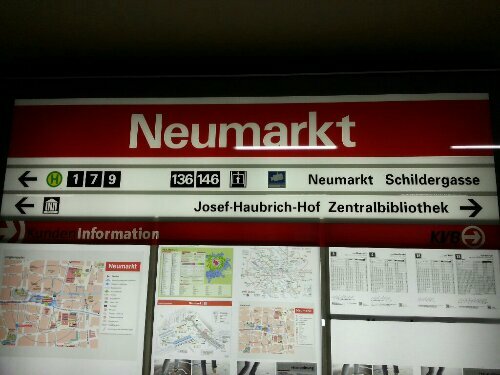 Now you want to reach Neumarkt, a rather central place in Cologne. Look for 5 seconds at that sign. Which way would go? If you’d walk right, be comforted. You’d be not the only one fooled by that idiotic sign. What can we learn for software from that? To a developer, it’s clear how her software works and how it needs to be used. So we rely heavily on testing by and input from others. Use bug reports as an important source of feedback! My colleague and me had got the task of creating an intranet site “like Facebook”. OK, so we checked alternatives and installed a site with WordPress and BuddyPress. Guess what, after we showed the result to our boss, friendships had to be removed, groups had to be removed etc. etc. After realising we had disabled virtually every BuddyPress feature and after struggling with getting some sort of rights system into the site, we finally recognized WordPress was not the right base for our site and went looking for alternatives again. Imagine we had settled on a proprietary platform, we’d been stuck! Drupal just is much more structured and generalized than WordPress. The downside is it takes you longer to figure out how things work. Maybe I should have looked into “Understanding Drupal” earlier but I just “had no time for that”. Community support is super helpful in irc or managing issues. Translation process is really cool, making it possible to edit translations in-site and (after a little configuration) also giving back to the Drupal community. So, if you want to hack together a simple page in short time, take WordPress, but if you need a little bit more structure, I’d recommend Drupal! Side note: As a Python fan I also tried https://www.django-cms.org/ but alas, it’s very hard to install compared to the two other systems. And if users won’t get your system installed, they won’t use it! And no, it isn’t helpful to first give you a toy server and then let you figure out how you turn it into a production system via several unconnected help documents. Installing Debian the easy way: Say Goodbye to Microsoft! You want to install Debian GNU/Linux on a machine? You don’t have an install CD at hand (or you’re facing a netbook)? USB booting is a nightmare? That’s the situation I was in lately. So I remembered some clever guys had turned the debian installer into a windows executable: The Debian Installer Loader. It’s available at the well memorizable site http://goodbye-microsoft.com/ and works absolutely perfect. It even preseeds some installation values from the Windows environment. You also have the choice whether you turn the machine into dual-boot (takes much time for shrinking NTFS partition) or convert it as a whole. This tool gets rated five stars by me! 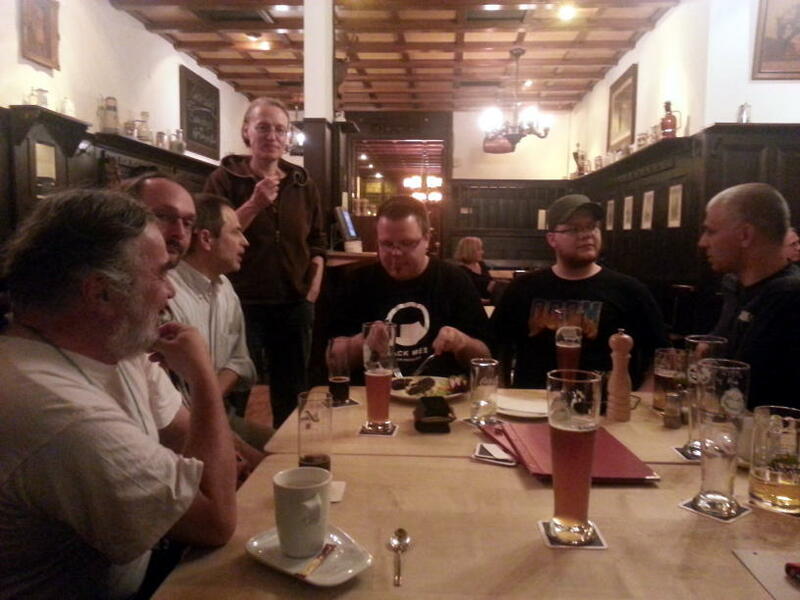 Wie an jedem zweiten Dienstag im Monat treffen sich wieder alle, die sich für Freie Software interessieren, um 19 Uhr in Bonn in der Pauke. Einzelheiten im Wiki-Eintrag der Bonner Fellowship-Gruppe. SFD 2010 in Bonn: Free balloons, Free Software! You can see more pictures (and hopefully also some videos) here.